This is the story of how nature and people shape each other. TIFFANY CASSIDY (HOST): This is the story of how nature and people shape each other. GENEVIEVE HILL: It’s a super powerful partnership to work between culture and nature. IRV BANMAN: A functioning ecosystem doesn’t just happen by default; it needs to be cared for and tended, especially in these days when there’s a tremendous amount of human pressures on the land. TIFFANY CASSIDY: You’re listening to Nature Talks: the Nature Conservancy of Canada podcast. Fascinating stories about nature, why we need it in our lives, and the passionate Canadians helping to protect it. I’m Tiffany Cassidy. This is episode two — The Meadow That Mattered. TIFFANY CASSIDY: Imagine your happy place. What does it look like? Ancient trees…a carpet of wildflowers? What does it sound like? A chorus of songbirds? That’s where we are now. Standing in a meadow of Garry oak trees on Vancouver Island. TIFFANY CASSIDY: That bird call is from the endangered vesper sparrow. From the birds you can hear around me to the plants at my feet, these are some of the rarest species in Canada. Including the Garry oak trees that grow throughout the meadow. Garry oak trees are twisted and gnarled. And they are old. Some of the trees in this meadow are centuries old. And between the trees are open meadows, where blue, yellow, red and pink wildflowers are blooming. JOCELYN WOOD: So we have deep soils that allow all of these native plant species to thrive, as well as the trees. TIFFANY CASSIDY: That’s Jocelyn Wood. She’s a scientist with the Nature Conservancy of Canada, and she’s showing me around the Cowichan Garry Oak Preserve — an hour north of Victoria. Jocelyn helps care for this place. JOCELYN WOOD: There’s so much magic here at the Cowichan Garry Oak Preserve. Like, it doesn’t necessarily matter what time of year you’re here. There’s always something going on to kind of wonder at and be amazed at. TIFFANY CASSIDY: Standing in this meadow on lush, green Vancouver Island, you might assume everything here must be thriving. But Garry Oak ecosystems and the plants and animals they support are threatened. And becoming rarer and rarer. Less than five per cent of the original Garry oak meadows in the world still remain. These trees and meadows are only found here and the nearby Gulf Islands, and a couple patches in mainland BC and along the western U.S. coast. If they haven’t already been lost to the development of towns, subdivisions and farmland, the remaining Garry oak habitats are being overtaken by invasive species. The Nature Conservancy of Canada is working to bring back the open meadows and the plants and animals that were here, before so much habitat was lost. And it turns out, we have a lot to learn from the people who were here before us. TIFFANY CASSIDY: This land has been used by people for thousands of years. It's the traditional territory of the Cowichan Tribes. TIFFANY CASSIDY: Genevieve Hill is literally digging into the history here of the Garry Oak Preserve. She’s an archeologist from the Royal BC Museum. And she’s looking for clues: a cooking pit, tools, scraps of animal bones…anything that might give a hint about what this land meant to people. TIFFANY CASSIDY: The rain gives us time to take cover and chat. GENEVIEVE HILL: It’s all speculation right now except for a few little hints. TIFFANY CASSIDY: Genevieve and her team have found strong evidence of ancient charcoal and crushed shells in cultural deposits. This is along the stream bank near where they’re digging — and that’s a clue that people probably lived here. Through their digs, scientists have found tiny particles of fossilized plants buried at different soil depths. From their evidence they conclude some of these sites have supported savannah and meadow vegetation for at least 2,000 years. Meaning, this place has actually been open meadow for thousands of years. Genevieve thinks she knows why it stayed open for so long. GENEVIEVE HILL: It’s quite likely that they were traditionally burning the area, but also, you know if they’re living in this area just think about how around your house, areas of any sort of thing like plant production, harvesting, cooking, things like that. Things just tend to be quite clear. But I think that there are strong lines of evidence for traditional burning here as well. TIFFANY CASSIDY: For thousands of years, the people of the Cowichan Tribes burned the meadows under the Garry oak trees. The burning prevented fir trees and shrubs from taking over. It also helped the wild camas to thrive. Camas is a plant with a purple or blue flower that grows from a big bulb. The starchy bulb is a bit like a sweet potato and was an important food source for the Cowichan Tribes and the Coast Salish communities. The ancient use of fire helped to manage the land and is why today we have these open meadows that are now home to rare wildflowers. The ecosystem was shaped by the people who lived here. GENEVIEVE HILL: It’s a super powerful partnership to work between culture and nature. And I know none of us can ever know all of the details that we would wish to know. But this partnership really allows us to explore this further. TIFFANY CASSIDY: Through her research and interviews with Cowichan Elders, Genevieve is piecing together what we know about how people used this place, and hopes we can use this knowledge to better manage the ecosystem in the future. GENEVIEVE HILL: To more accurately represent what the traditional use of this landscape was on the provincial record and to make it known publicly that this area was of importance to ancestral Cowichan people. TIFFANY CASSIDY: Spring blossoms are everywhere here…This is the only place left in Canada where you can find some of these plants and animals. Like the bright, colourful yellow montane violet. The subspecies that grows here is endangered and only found on Garry oak habitats. And near them, a sea of pink few-flowered shooting stars. Pollinators love this place — that includes bees, but also birds, moths and butterflies. Keeping this place for the birds and other animals that rely on it means starting at the ground level. That’s what Jocelyn shows me as we continue our tour. JOCELYN WOOD: So we’re standing next to this fence here. And you can see the amazing restoration work that we’ve had going on. So we put up the fencing in the spring time when all the flowers are coming up just to keep all of the deer. There’s a lot of deer on Vancouver Island and they love to munch on all of these flowers. So we put up the fencing to keep them out. TIFFANY CASSIDY: The fence keeps the deer out… and another animal in. TIFFANY CASSIDY: Sheep are munching on shrubs and non-native grasses. The people caring for this place bring the sheep in once the native flowers have bloomed and gone to seed. The sheep keep the invasive plants down and the meadow open. For years, careful and intentional fires helped to keep the land open. Today the Nature Conservancy of Canada sometimes uses prescribed burns. But the sheep also do some of the hard work. JOCELYN WOOD: And we get these resulting beautiful pockets of blossoms. TIFFANY CASSIDY: You may be wondering how sheep came to be on the preserve. Irv Banman introduced them. IRV BANMAN: So you want me to spell my name? IRV BANMAN: My name is Irvin Banman. It's I-R-V-I-N.
TIFFANY CASSIDY: He’s been helping to care for the Cowichan Garry Oak Preserve for more than 16 years. He’s a restoration expert for the Nature Conservancy of Canada. And he tries to understand what this place has meant to people. Even his kids helped him keep up the meadow. IRV BANMAN: Oh it’s a tremendous privilege to be able to spend a portion of my kids’ lives here. TIFFANY CASSIDY: Irv joined the Nature Conservancy of Canada shortly after the group started working here. At that time, this place was overrun with invasive species. These are plants that didn’t belong here and make it hard for native plants to grow. Removing invasive species was part of his children’s chores. And it taught them a respect for nature, and that some ecosystems need our help. IRV BANMAN: Definitely they know that a functioning ecosystem, it doesn’t just happen by default. It has to be cared for and tended, especially in these days when there’s a tremendous amount of human pressures on the land. TIFFANY CASSIDY: Caring for this one largely means controlling invasive species like English ivy that covers the ground or creeps up tree trunks and chokes out native plants. Or Scotch broom — a yellow-flowered shrub that can grow into thickets that are so dense, deer and other animals can’t move through them. It also creates too much shade for native plant species. With few natural predators, these invasive species can take over. TIFFANY CASSIDY: Walking through here, you have to be careful. There’s a narrow path to help you navigate. It would be very easy to step on a rare wildflower if you don’t watch where you put your feet. But the reason these rare wildflowers are blooming is because invasive species were removed. IRV BANMAN: To see the native plant populations rebounding, coming back, in areas that were really barren or invaded by broom or grasses or things like that. So yeah, I think it’s the incredible resilience of the ecosystem. Although we think of it as being fragile, it’s easy to damage but it’s also fairly resilient. TIFFANY CASSIDY: Irv and his family may have cared for this place for the last two decades, but there are many others who have rolled up their sleeves to help. Irv’s helped inspire volunteers to join in. More about the volunteers who have taken this place to heart, after the break. TIFFANY CASSIDY: The Nature Conservancy of Canada is a national charity. We protect important natural areas for the species that need them – from Garry oaks to humans. Think you know a lot about Canada’s native plants? To answer our quiz and to learn more about this work, go to natureconservancy.ca/podcast. Nature c-o-n-s-e-r-v-a-n-c-y.ca. TIFFANY CASSIDY: The Cowichan Garry Oak Preserve is a piece of living history. These meadows have been cared for by people for thousands of years. Today they are threatened, but the Nature Conservancy of Canada, with the help of local volunteers, is working to maintain the Garry oaks and the open meadows here. I’m standing in the plant nursery at the Cowichan Garry Oak Preserve. This is a special community event — the annual In Bloom Wildflower Festival. It’s a chance for the community to come, walk around and experience this sensitive preserve while all its colours are popping. There are plants on sale that were grown from seeds that volunteers spent many hours collecting and carefully raising. TIFFANY CASSIDY: Sheila Kitson has volunteered here since 1998, when she helped raise money for the Nature Conservancy of Canada to purchase the Cowichan Garry Oak Preserve. Now, she and other volunteers meet here every Wednesday. They find lots to do. SHEILA KITSON: Things like collecting seeds, [Laughs] which can be a very monotonous thing. TIFFANY CASSIDY: Monotonous, maybe. but the volunteers are really important to the survival of this place. They collect the seeds from wildflowers, help plant them in the meadow. Monotonous, but worth it. SHEILA KITSON: When you see the effect, and I’m sitting on a chair in the preserve here and it just is [A-OK clicking sound]. The oaks are sort of gnarly and small, and at night they look quite spooky. But yeah, it’s a neat place. That’s why people come. TIFFANY CASSIDY: Another reason people used to come here the striking western bluebird. It was once common here, before so much Garry oak habitat was lost. By 1995, they were gone. Almost 20 years later, in 2012, conservation groups got together to reintroduce the bluebirds to the area. This Cowichan Garry Oak Preserve, protected by the Nature Conservancy of Canada, was chosen as the first site. The group of partners worked together to translocate pairs of bluebirds from healthy populations in Washington State and reintroduce them to the Garry Oak meadows. And then they held their breath. Would they mate? Would they raise their young here? Would they return next spring? TIFFANY CASSIDY: The answer is yes…Today the Cowichan Valley Naturalists Society monitors the bluebirds’ progress. The bluebirds have returned each spring, to the delight of visitors and staff alike. JOCELYN WOOD: I love coming out here every single year with some binoculars, and looking at them from afar and watching them mate and hang out over their clutches of eggs. It’s very exciting to see western bluebird back here. TIFFANY CASSIDY: This place is beginning to look and sound much like it did for millennia. 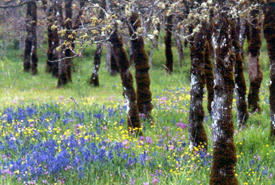 The Garry oak meadows matter for plants, for animals and for people. People have been coming for thousands of years. Today, we’re learning how to care for it for thousands more. The Nature Conservancy of Canada does amazing things, like protecting one of the last Garry oak meadows that has mattered to people for centuries. This work is only possible because generous people like you donate. If you would like to support this work, go to natureconservancy.ca/podcast and click on the big orange donate button. All amounts make a difference. TIFFANY CASSIDY: Like what you heard on our podcast? Subscribe to future episodes on your favourite app. Give us a tweet [BIRD TWEETS] using the hashtag #NatureTalksPodcast. Share it with a friend. Or email us at podcast@natureconservancy.ca. Are you looking to explore the amazing places we talk about in this podcast? Go to natureconservancy.ca/podcast to see our sites that you can visit. TIFFANY CASSIDY: Next time, we’re going to the other side of the country, to a village on the Bay of Fundy. And we’ll meet the people trying to save its water supply. Thanks to everyone who shared their stories with us: Genevieve Hill, Irv Banman and Sheila Kitson. Thanks to Jocelyn Wood for her expertise, and everyone else at the Nature Conservancy of Canada who put this together. And thanks to Pop Up Podcasting. Some of the birds you heard were from the Macaulay Library at the Cornell Lab of Ornithology, from recordists Thomas G. Sander, Wil Hershberger and Jeffrey A. Keller. And the cool banjo theme music you’re listening to is by NCC staffer/musician Carly Dow. Check out her music at carlydowmusic.com. TIFFANY CASSIDY: I’m Tiffany Cassidy. Thanks for listening.